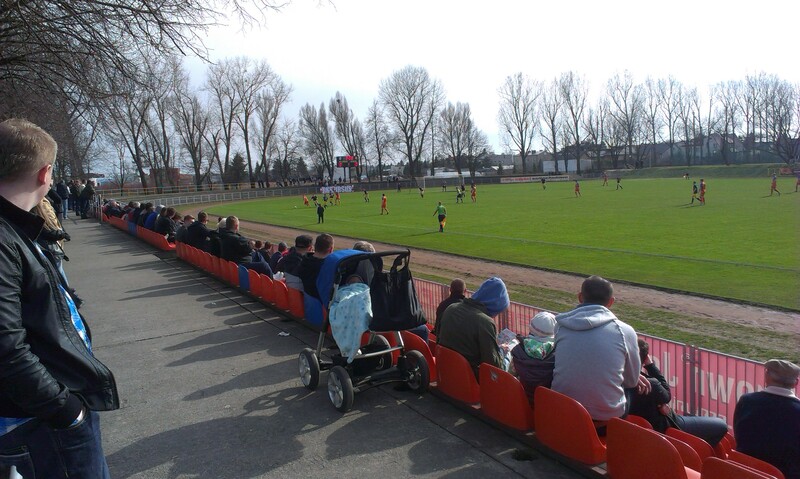 Yesterday I donned my travelling shoes and set off to south-west Warsaw to watch the Łódź-Mazovian III Liga (4th tier) encounter between Ursus Warszawa and fellow Warsaw area side OKS ‘Start’ Otwock. Ursus are having a successful season and before yesterday’s game they sat in 3rd position, five points off the leaders Legionovia Legionowo, OKS on the other hand are comfortably ensconced in mid-table. Ursus are a relatively successful club by Warsaw standards; in the 1970s they twice finished as high as 5th in the Polish second division and in the summer of 1978 even famously beat the mighty Górnik Zabrze. By the millennium they had however slipped to the 5th tier of Polish football and were only promoted back to the 4th tier in 2010. Since then they have steadily improved their league position year after year. OKS have a rather less illustrious history but they finished as high as third in the third tier in 2009 before being relegated two years ago. So two relatively decent clubs by local standards. 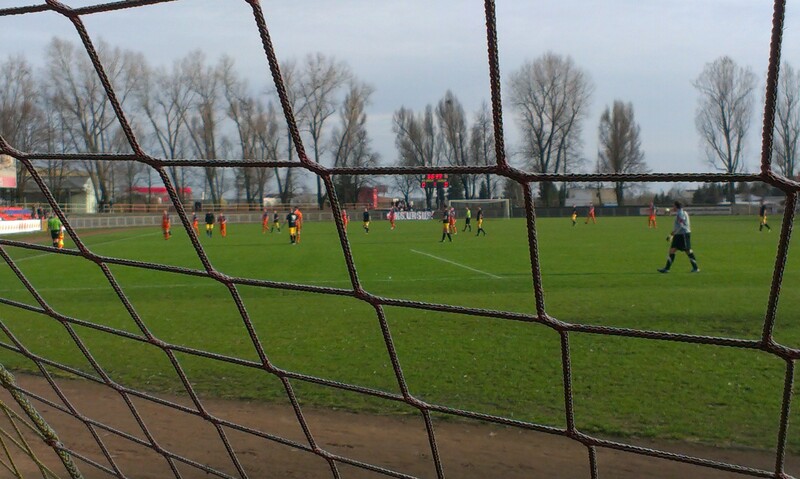 After two recent trips to LIga Okręgowa (6th tier) games I was interested to see what the standard of football would be like. 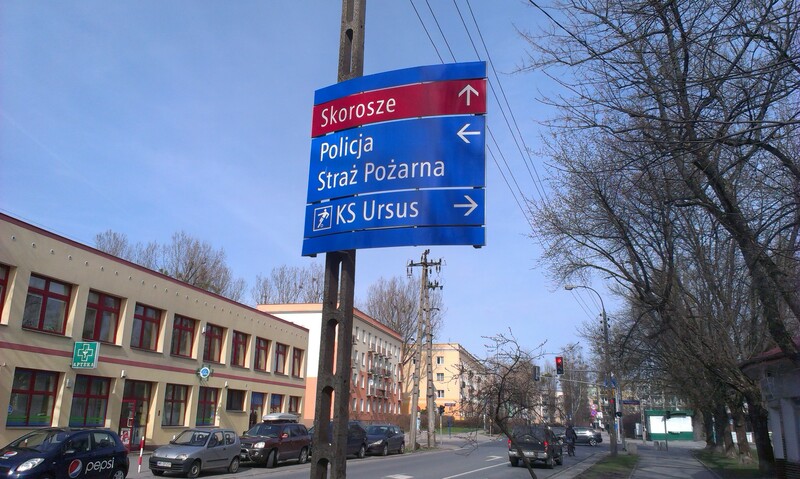 Ursus sits right on the other side of the city from Warsaw’s right bank and a trip is relatively arduous due to the poor coverage of the Warsaw metro. After an hour, and a change of buses, I finally arrived in Ursus and set about finding the ground. First of all though I had to locate a cash machine. Last week Ursus brought in an entrance fee of 5 zlotys (£1), a move which was met with uproar from part of the club’s fanbase. In Poland it seems that few people want to pay even a symbolic entrance fee when it comes to 4th tier football! Anyway I had no money on me, so after getting some out I made my way to the club’s stadium. At the ground a man had a little table set up taking people’s entrance fees. 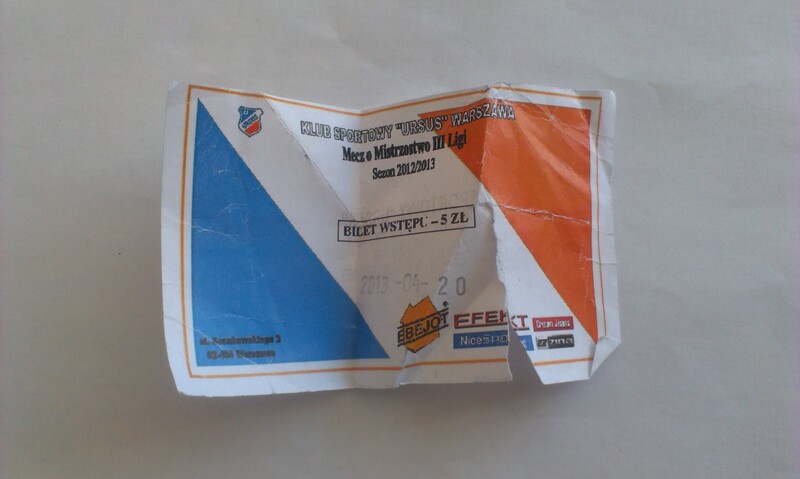 I was given a small printed ticket which the security guard ripped in half, I was quickly searched and I was in! My first thought on entering the stadium was the relaxed and family oriented nature of the site. There was one main stand in which the majority of fans were sitting, these consisted of several drunk men, parents with kids and local teenagers with nothing better to do on a late Saturday afternoon. On top of that behind the stand was a basketball court, on one side there was a community swimming pool and little kids whizzed around the boundary of the pitch on bikes with their stabilisers on. It was a surprisingly communal and pleasant experience. As for the match itself, OKS started off the stronger, Ursus seemed intent on lumping balls up to their strikers, whereas the team from Otwock looked to build play from the back. Despite their superiority there was a severe lack of goalmouth action and the first half was a pretty drab affair. 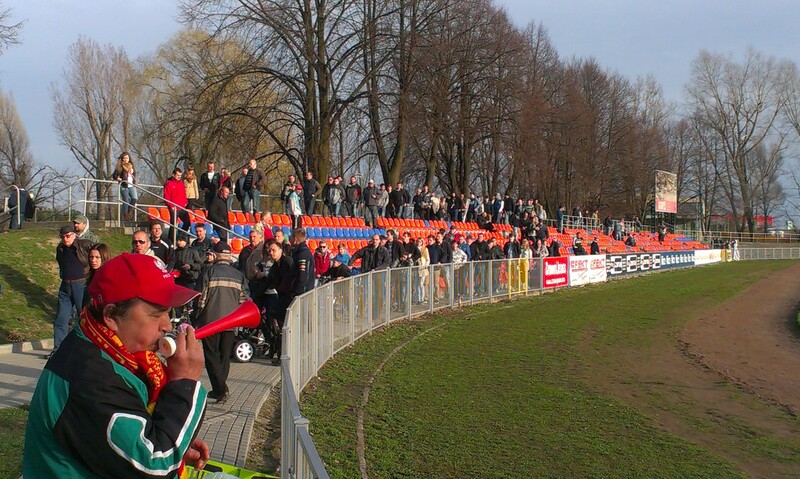 It was slightly livened up by the presence of Ursus and Otwock ‘Ultras” section who sang a bit at various points of the match. 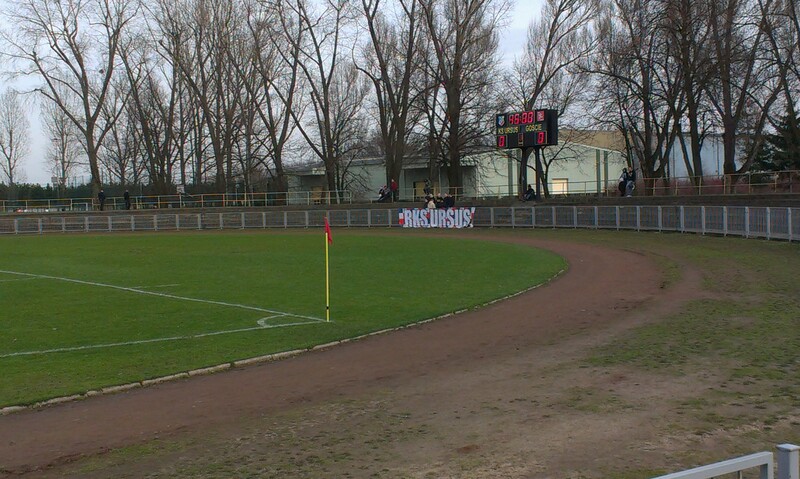 My favourite chant was when the Ursus ultras belted out from behind the goal ‘OTWOCK POKONAMY!! !’ (WE WILL BEAT OTWOCK!! !’) and one drunk guy in the main stand shouted back ‘I URSUS KOCHAMY!! !’ (AND WE LOVE URSUS!!!). At half-time I took a stroll round the pitch and tried to find something to eat, quite a lot of the Ursus support seemed to leave the ground at half-time (most of them made it back for the second half). There didn’t seem to be any food stands so I went into the swimming pool building and got myself a coke and some crisps in time for the restart. The standard of play from Ursus after the interval was much improved. Ursus did a much better job of keeping the ball on the floor and put much more pressure on the OKS defensive line. They were assisted in this by bringing on former Polonia youth team players and attacking midfielders, Kamil Rytel and Patryk Kamiński, who were much more adept at playing a passing game. Rytel came on at half-time and immediately looked to play one-twos with Ursus’s frontmen. 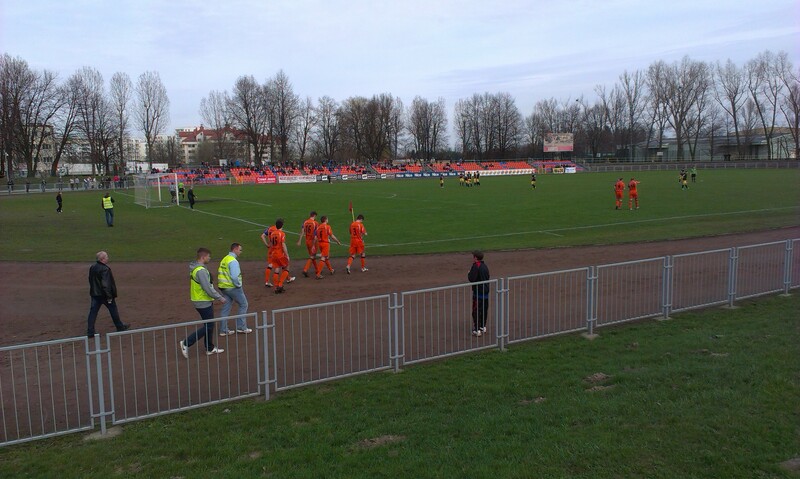 Kamiński appearance in the 66th minute especially improved Ursus’s play. Kamiński, a former OKS player, was once one of the stars of both the Polonia and then Legia youth systems and even had a trial at Southampton. Since then his career has taken a turn for the worst, playing for OKS and 3rd tier East leaders Wisła Płock. Transferred to Ursus in January and still recovering his fitness, yesterday’s performance suggests he will be a key player in the Warsaw team’s promotion push. Whenever he got the ball he looked to play interesting passes and his influence meant that by the end of the game Ursus were well on top. Unfortunately they weren’t able to make the breakthrough and the game ended 0-0. So the crowd and I headed off towards the exits, I enjoyed my afternoon at Ursus, and I aim to be back before long. Next week’s mission. Get to watch Gwardia Warszawa in the A Klasa (7th tier) against Anprel Nowa Wieś and there’s also the small matter of Polonia Belchatów on Saturday. Check back with me for more then. 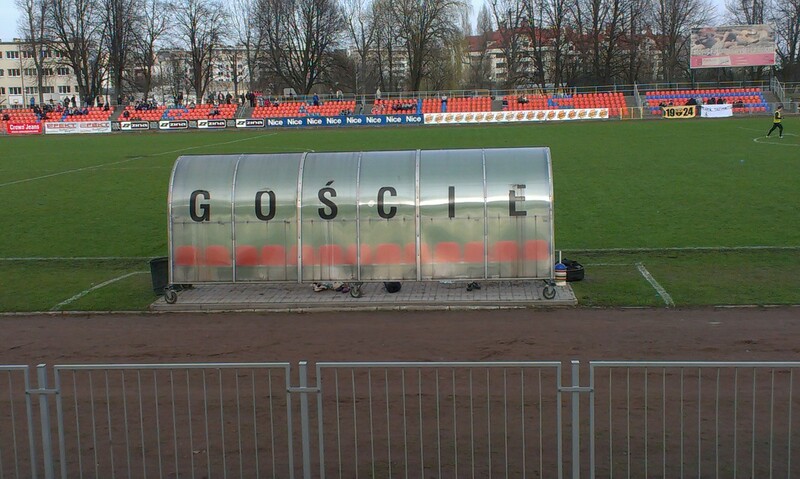 This entry was posted in Uncategorized and tagged Górnik Zabrze, Groundhopping, III Liga, KS Ursus, Legionovia Legionowo, OKS Start Otwock, Patryk Kamiński, Polish football, Polish Ultras, Ursus, Warsaw, Wisła Płock. Bookmark the permalink.